First up is China Glaze Secret Peri-wink-le which is quite a lovely blue-ish shade. It comes with a regular nail polish brush and applied a little streaky but the second coat fixed it. Dries relatively fast compared to cheapo pasar malam polishes but not as fast as those quick drying ones. Since it says it contains hardeners, I tried bending my nail and to my shock, my nail felt harder! Which is awesome, of course.. =) The finish is shiny & smooth by it's own but looks better with a top coat. Next is Nicole by OPI's Prized Possession Purple, which looks very similar to Sally Hansen's Pronto Purple (even the brush!). Will do a comparison swatch another time. I think Sally Hansen is redder though. Check out the Perfect Stroke Brush.. I've always preferred these kinda brushes (wide and flat on one side) as it makes application easier and smoother. Doesn't it look similar to SH? (pic below) SH's brush looks better and more precise, giving better control while OPI's is more fluffy. As for the polish, SH looks pearly while OPI leans towards fine shimmer. Basically, the Perfect Stroke Brush is better than the normal brushes but could be improved. I had to apply 3 coats of this to look decent but I think 4 or 5 coats would look perfect. The shimmer isn't very noticeable, which is a shame.. Applies a little goopy but it smoothens out and dries in minutes, protecting the polish beneath it ^_^! No scratch marks, finger print transfers or dents. 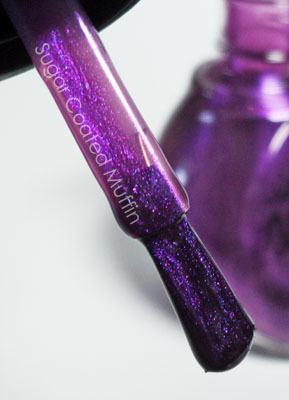 It gives extra shine and makes my polish look so juicy and thick. Applying this above the China Glaze helped it to dry faster (impatient me..). My nails with all 3 products! Oops.. Didn't clean the excess =_=" I think I have not applied top coat on the purple too. Bleh..
My conclusion : I honestly think Secret Peri-wink-le is a very beautiful shade. The polish glided on like a dream too. Prized Possession Purple took more work but the brush is better. 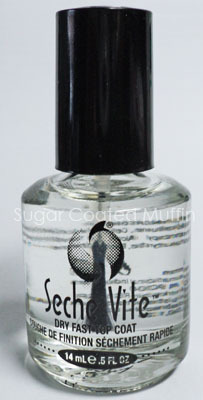 As for Seche Vite... Awesome! 'Nuf said. 10% discount to Secret Allure Facebook fans. Purchases exceeding RM300, a promo code of 10% discount will be given to be used in your next purchase. Purchases exceeding RM500, a promo code of 15% discount will be given to be used in your next purchase. ** Products were provided by Secret Allure for review purposes. However, this has not affected my thoughts on the product in any way.